Not since Hitchcock's The Birds has anything inspired such a fear of winged creatures as Demon Attack. In this vibrantly colorful, highly imaginative and challenging game, Imagic has replaced the standard relentlessly descending aliens with wave after wave of rainbow-colored birds who, by a strange quirk of evolution, have developed lasers as part of their anatomical makeup. 2nd review If you are an active 2600 player and you don't have this game, you need to go find it. I'm amazed at just how much fun Imagic managed to cram into four kilobyes with this one, and this game never disappoints. Overall, Demon Attack is a great shooting style game for your 2600. If you like any other shooting games from Space Invaders to River Raid, you'll love this game! Demon Attack is a must-have, but don’t think of it as a substitute for Phoenix, which you should have in your collection as well. Les effets sonores, le graphisme poussé (il faut voir les deux silhouettes d'oiseaux partir de chaque côté de l'écran pour se réincarner) offrent un réel plaisir de jeu. De plus, le haut niveau de compétitivité fait que le joueur le plus blasé passera facilement la moitié de la nuit sur son VCS afin d'affronter un écran de plus. Demon Attack is one of those must-own games. Its a common cart and easy to find on the cheap. It's a unique shooter that brings a "new" feeling to a familiar bottom-shooter scenario. Go pop this in your 2600 and take out some birds! Você dispõe de um canhão laser e deve se defender do ataque de naves espaciais. Desenvolva habilidade para, rapidamente, entrar embaixo delas, atirar e sair. Durch einen zu zweit spielbaren Kooperativmodus und einer Vielzahl an verschiedenen Gegnern beweist das Spiel seine spielerische Qualität und Langzeitmotivation. While Demon Attack's graphics and sound aren't overly impressive, each wave sports a different set of aliens, and I like how they gyrate in a freaky manner. 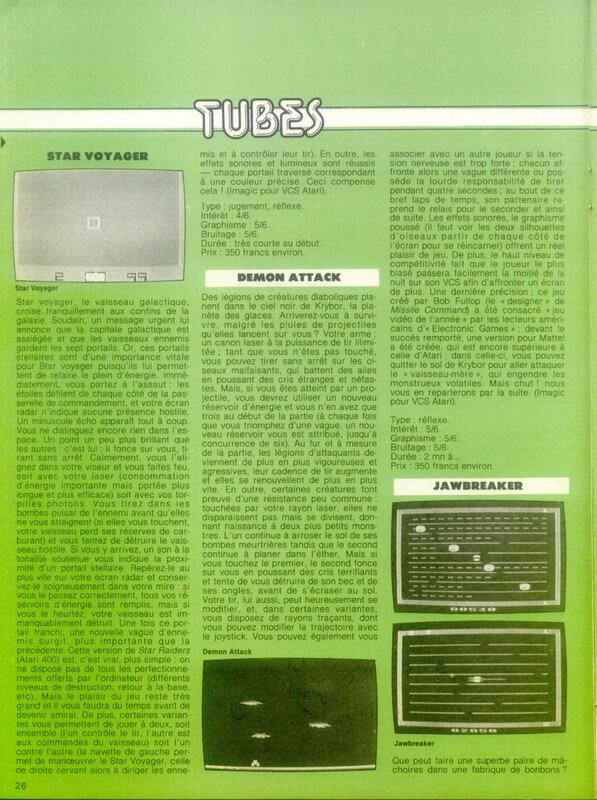 Demon Attack is definitely required in your Atari 2600 library, as it's not only a great shooter, but it's a launch salvo from one of the era's best developers. All in all, however, it's still the same 'ol same 'ol, but one can't help but appreciate the care and effort put into this game. It doesn't break any new ground, but if god is in the details, Demon Attack could very well have become a religion all its own. Obwohl man nichts anderes tun kann als ausweichen und schießen, ist dieses Spieleprogramm ein recht beeindruckendes - es sei denn, man lehnt diese - zugegeben - recht simple Art der „Ballerspiele‘ grundsätzlich ab.